Monocular visions is seeing with one eye. Binocular vision is seeing the same object with both eyes is at one time. It is defined as observing the object in SD, a process requiring a person to have normal binocular vision. A person with vision in only one eye can not see stereoscopically. If figure two eyes are separated y a distance ‘b’ called eye base or intraocular distance (65mm or 2.6//). Combined image of a and as seen left and eyes appear to fuse at ‘M’ while images of b and b1at n. The distance MN is the stereoscopically depth and is the measure of the height of A over B. Φ1 and Φ2 are the paralytic angles. 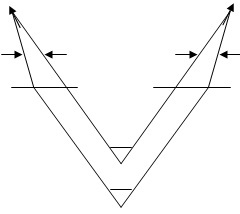 Stereoscopic depth depends upon the diff between Φ1 and Φ2 i.e, on the sum of angles and made at the left and right eyes respectively. If two photographs of the same obj are taken form two diff perspective or camera stations, the left print (photo) seen with the left eye and the right print seen with the right eyes simultaneously, a mental impression of the three dimensional model results. In it two lenses or narrow angled prisms are used. In mirror stereoscope mirrors are used. It allows greater area of the photograph to be covered. In order to obtain stereo pair every part of the ground to be surveyed must be photographed at least twice. To achieve this aero plane flies in strips and takes photographs with a 60% fore and aft overlap. To secure the 50%min needed for coverage overlaps the abjection strip by 30% to make sure that no part of the gourd is left unrecorded often called side overlap. This fore and aft overlap insures stereoscopic coverage along the strip with some coverage along the strip with some margin for error; two adjacent photographs taken in this way are called the striper. The flying height depends on the following factors. The scale of the map or plan. The type of country flat or mountainous. The characteristics of the camera i.e focal light. Lp = length of photograph in an or inches in the dir of flight. Wp = width of photograph in cm or inches # at right angles to dir of flight.